The company’s strength lies in its ability to competitively supply electrical insulation and other materials to a wide range of industries. uki can assist you with material selection to ensure you get the most suitable and cost effective solution for your specific application. Its core philosophy is meeting customer's needs in a reliable, cost-efficient manner, with an emphasis on service and response, enabling rapid growth within the company. 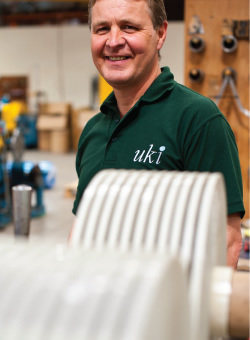 The dedicated team at uki understand that fast delivery is important so they strive to help you receive your bespoke materials in the most efficient way possible. Quality is assured through accreditation, by British Standards Institute, to ISO 9001:2008, a standard which the company values and protects. The business has evolved into two divisions, with specific skills and knowledge in each area. Either division can fulfill your needs, whether that is in the supply of bespoke materials or whether you wish us to convert your own materials.